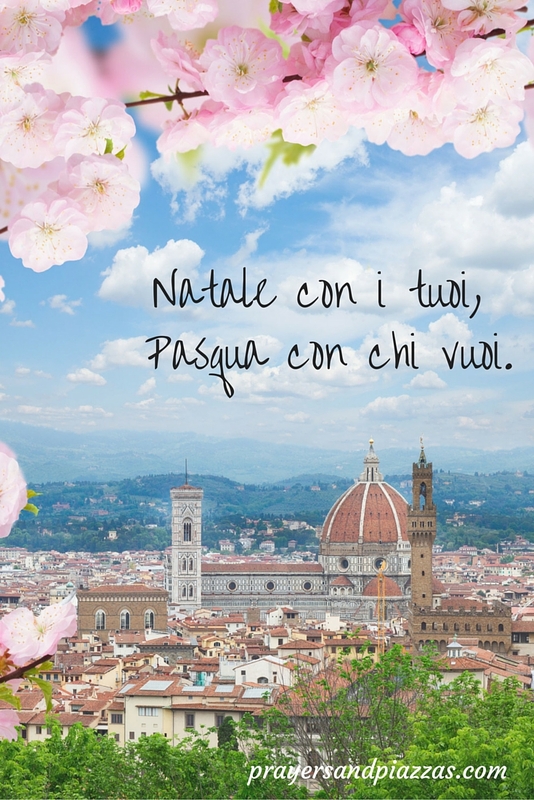 This popular Italian proverb means, “Christmas with your family, Easter with whomever you want.” I imagine Holy Week is full of festivities all over Italy! Please share in the comments any special experiences you’ve had during Eastertime in Italy. Looking for more Pasqua-related proverbs? I suggest L’Italo-Americano. For Italian Easter traditions, visit Becoming Italian Word by Word (this is my go-to site for Italian culture and history.) And below is a “sweet” dual-language video by La Studentessa Matta that you’ll enjoy! Tags: Florence, Italian Easter proverbs, Italian Easter sayings, Italian Proverbs, Italy, Pasqua, Snapshots from Italy, Travel. Bookmark the permalink. We once were in Venice and Nice just before Easter, and could have devoted all our time simply to gawking at the displays in shop windows, churches and city squares. I did learn something about the use of palms shaped into decorative forms. When I was a kid, they gave me a palm frond on Palm Sunday, and that was it (the only time of year one saw one in Ohio). Not so in Europe, and I wrote about the elaborately-woven palms we saw in a post: http://wp.me/sH6ZJ-palmers. Happy Easter. What a wonderful experience to be in Italy in the Easter season! I’ve always heard: Pasqua con i tuoi, Pasquetta con chi vuoi. Easter with the relatives, the day after Easter with whomever you want. I just came upon a Calabrian proverb apropos of today that doesn’t bode well for my upcoming trip to the region: Si chiovi lli quattru aprilanti, chiovi jiuarni quaranta. If it rains on the 4th of April, it will rain for the next 40 days…. Yikes! Hi Karen! Your version of the Pasqua proverb makes more sense! As for the rain, I hope the proverb proves incorrect! Thanks, me too!! Buona Pasqua!